this was the view from our window. just there, a window seat, slightly narrow and not long enough for sleeping on (or i would have). i want to tell you about the way my shoulders relaxed and my breath naturally came more deeply once we arrived and threw open the windows. and how i found an enamel casserole pan in the kitchen that was the perfect size for baking bread in. and how locating the trevelyan farm shop was so much easier this time around. and how everything was familiar and yet brand new and waiting to be discovered. and how we bought a beautifully chilled bottle of camel valley sparkling brut from the old ship and cracked it open sitting on those seats down there. and how we feasted on fish & chips whilst drinking the bubbly, watching two old salty sea dogs shout insults at each other on the other side of the pier. and how later we learned that one of them is called ‘angry mike’. and how we had lunch at the barefoot kitchen and tonight i’m cooking prawns with chilli, garlic and lemon because i had them for lunch that day and they were really good. and how we tried white anchovies for the first time for dinner on friday night, and they were good too. and how i came home with sand in my hair. 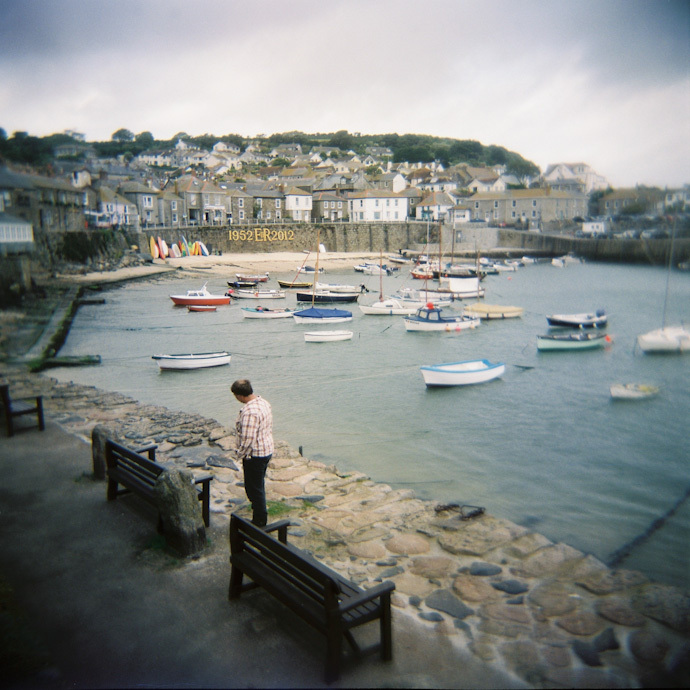 This entry was posted in travel, uk and tagged cornwall, holga. Bookmark the permalink. That sounds incredible… I can almost smell the salty air just from your photo and description. You are capturing magic with your Holga.